We were at the Emden market on Saturday and they had the most beautiful cabbages. While everyone else was filling their bags with fresh German white asparagus for seven euro per kilo, we had already partaken twice this past week, so we opted for the red cabbage. A huge cabbage for only one euro. Organic chicken breasts from another stand for 4 euro and a little chunk of Gorgonzola for 2 euro. A healthy and cheap meal for two. Place 1 inches slices of a nice fresh red cabbage on a baking sheet in the middle of the oven at 200 degree Celsius. Set your timer for 30 minutes. Meanwhile poach your chicken. Oh, did you forget how to poach your chicken so it doesn’t crimp into a little hard fist? Refresh your memory here. When your chicken is done remove from water, rinse off the white gunk, wipe out your pan. Take your cabbage out of the oven and remove any overly brown edges. 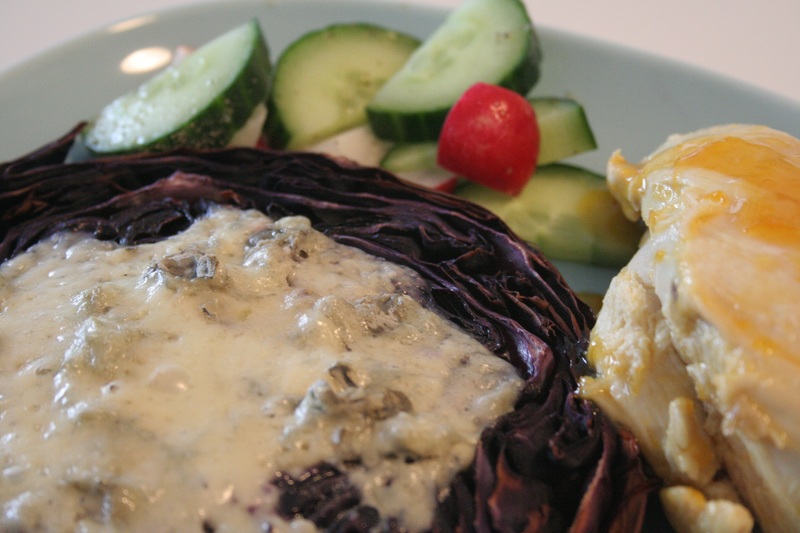 Decorate the cabbage with chunks of Gorgonzola and drizzle with olive oil. I find that the cheese is salty enough, but if you need more wait until it comes out of the oven. You don’t want it to release a lot of moisture at this point in the roasting. Back in the oven for 10 minutes or until the cheese is bubbly. Apricot Glaze: Place two to three tablespoons of apricot jam in your warm pan. Add around a half a cup of orange juice and reduce to a syrup. Toss your breasts back in the pan so they warm up and get shiny and pretty. Serve with some raw veggies and voila, an antioxidant packed dinner for two in 40 minutes. Hubby gave it 5 stars in the healthy dinner category. 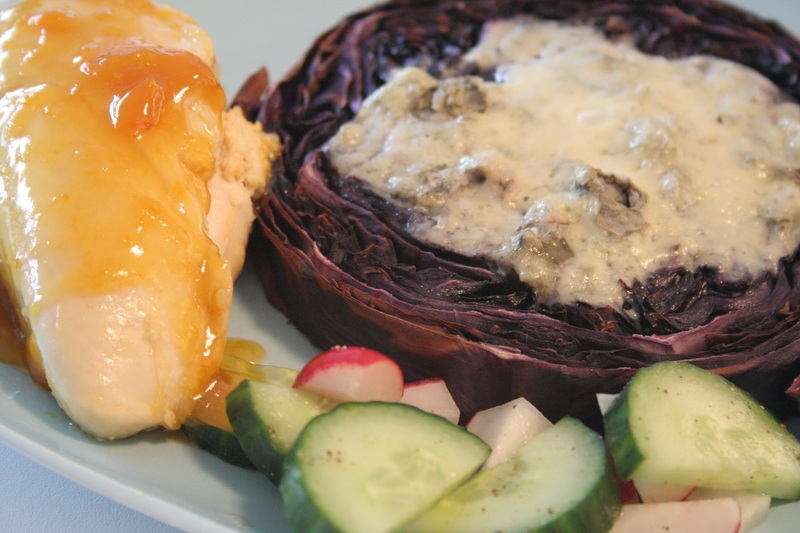 This and other yummy cabbage recipes by The Little Red House. Wow, that looks incredibly yummy, gorgonzola cheese makes anything good! 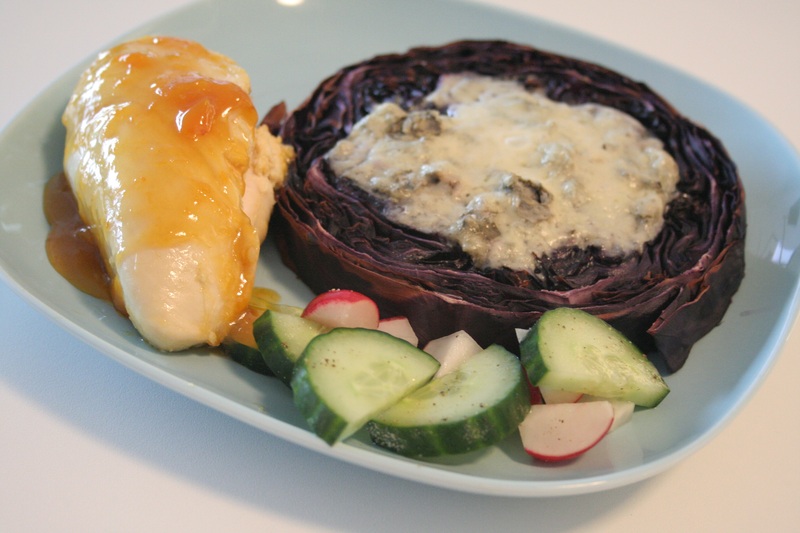 The red cabbage gets slightly nutty flavor in the oven and the gorgonzola is a great pairing. Now that I think about it some crushed walnuts would be a nice topper for this. Thanks for stopping by and taking the time to say yum! It means a lot from you since you have really super yummy stuff going on at your place.